Customer support software is a tool that helps businesses in the management, organization and tracking of customer queries and concerns. It also stores all information relevant to customer service, which can be used to come up with valuable business insights. If you want to level up your customer service you need customer support software. Using email to answer customer issues and tracking them on spreadsheet may be cheap, but you are risking losing customers if they get angry because you missed their email. What is customer support software? The simple definition is, the purpose of customer support software is to enable you to manage, organize and track customer requests using a single platform. Likewise, it consolidates these issues and conversations and associate them with customer records, providing your CRM and sales more insights to personalize campaigns. The main feature is the ticketing system, which transforms customer emails, calls, social posts and chat messages into tickets and routed to agents for immediate resolution. But what is customer support software really in relation with other service-oriented solutions like help desk and service desk? 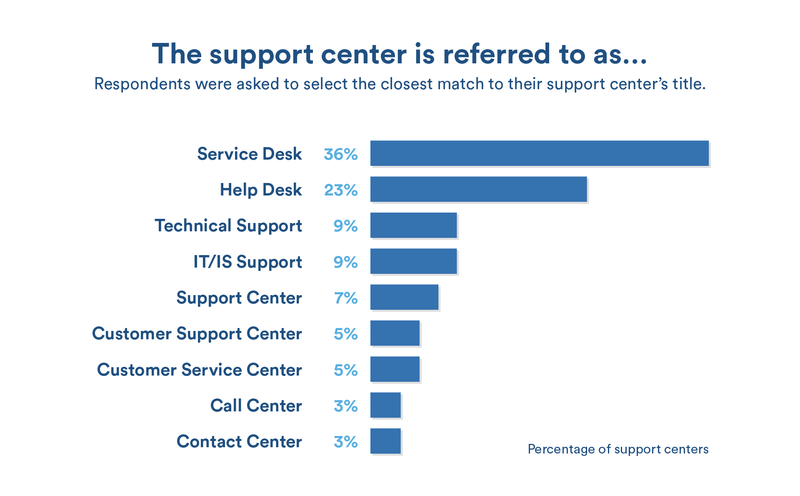 In a study by HDI, an association of technical support professionals, support center is most commonly referred to as service desk (36%) or help desk (23%). Both support channels, however, focus on providing technical assistance, either to customers or employees. Specifically help desk handles break-fix cases, for example computer crashes, while service desk not only addresses break-fix issues, but also accommodates tech-related requests like a new computer. In contrast, customer support software is a more general help desk that tries to resolve customer queries around the product beyond its technical aspects, but within the break-fix mold. If you still doubt whether you need a customer support software, consider the characteristics required of a support center in the next five years, according to a research by HDI and Robert Half Technology. All these are enabled by a good customer support software. The definition of customer support software is that it helps answer customer issues. On this note, we can group these top five solutions as good examples of customer support software. Freshdesk – It is one of the best customer support apps and, in fact, our top choice in this category for its robust yet intuitive tools. The software is scalable to the needs of small businesses as well as large enterprises. It is this flexible capability that makes the app adept at almost any business environment. The topnotch features from this software include smart automations, multiple SLA policies, multi-channel capability, self-service portal and an integrated game mechanics. Likewise, Freshdesk allows you to plug in a live chat and phone support and integrate with CRM and legacy business apps to extend its functionalities. It also features robust mobile Android and iPhone apps that let you carry the whole system on the palm of your hands. Its standard features are email integration, ticketing, knowledge base, time-tracking, multi-product and reporting. Salesforce Essentials – This brings together in one platform Salesforce’s renowned CRM with a customer support solution to drive efficiency and productivity, enabling sales agents to sell faster and smarter, and customer service teams to provide consistent customer experience. Intended for the requirements of small business, the software is equipped with built-in intelligence, an automation engine, and multi-channel capabilities to help customer-facing teams drive sales and deliver the best service. The platform’s customer support module is able to automatically connect with customers from whatever channel – phone, live chat, email, social media – to receive queries, categorize and prioritize them, and route them to the right agent for fast resolution. It comes with a powerful case management feature to help cut down ticket volume and enhance data reporting to help support teams identify, monitor, and resolve issues efficiently. LiveAgent – Designed to make help desk simple to set up and use by non-technical agents, LiveAgent is robust, featuring tools like live chat, email support, social media integration, gamification, file sharing and contact forms. Specifically, it features the Unified Storage, which acts as a centralized repository of all tickets, emails and conversations that agents can quickly access, associate and consolidate. LiveAgent also provides 24/7 support across its plans, a rare deal in this category. It can handle huge volumes of queries with smart ticket routing and a robust knowledge base. Likewise, it features powerful social media integration using tags, keywords and brand mentions that allows for quick responses to negative comments or capture of positive mentions to be used for marketing campaigns. Its other key features include support portal, multilingual support, reporting and SLA. Samanage – An IT service desk and asset management solution, Samanage helps you manage all your IT asset data, hardware, specs and licenses. Customers or employees can submit requests online, which enables you to access relevant asset configuration fast to resolve a ticket. It streamlines the entire service process, from request submission to ticket resolution. Likewise, it integrates with other business apps like Google Apps, Zendesk and email clients. Creating SLA goals is also easier with the system following ITIL protocols. Other key modules are self-service portal, risk detection, tailored dashboard and automatic classification. Zendesk – Easily one of the more renowned customer support apps, Zendesk is easy to deploy and applicable to a wide range of business types. It provides multi-channels support, including email, phone, live chat, social media and self-service assistance. Likewise, it allows for branding and customization, which enables small businesses to appear more professional and reputable. Zendesk’s reporting is also robust, featuring tools for customer satisfaction rating, agent performance and comparing your customer service rating with others in your industry. The app integrates with important systems like e-commerce, CRM, social media, productivity apps and CMS. TeamSupport – The app is designed for collaborative support allowing different departments to work closely together on tickets. For example, sales, tech, marketing and support can share inputs and insights to resolve a difficult case fast. TeamSupport suits the support requirements of many B2B companies. Among others, features include live chat, ticket management, ticket automation, screen recordings and self-service portal. Likewise, it integrates with mailers, cloud storages, productivity apps and other key business systems. ngDesk – a cloud-based integrated customer service platform that combines ticket management, mobile support, and help desk reporting into a single unified package. It is also a free platform regardless of how many agents use it for their customer service-related tasks, an ideal customer service solution for enterprises and organizations that look for a powerful customer service software without the heavy price tag. Collect.Chat – a user-friendly chatbot builder tool that lets users create chatbots for websites as an alternative to static web forms and sales representatives in engaging and interactive visitors. This application lets you create chatbots within minutes and users don’t need to be expert in coding to use the software. With Collect.Chat, companies and individuals are able to gather more information from their visitors, generate and track more leads, and improve conversion. The application automates everything. Apart from generating leads, Collect.Chat is an ideal platform for building email lists, scheduling sales meetings, gathering feedbacks, executing surveys and much more. Yoummday – the world’s first online marketplace of professionals for virtual contact support. It is based in Germany with offices in South Africa and various European countries, and has talents who can speak several languages from all over the world. Greetly – a self-service digital reception kiosk for working spaces. This application is especially helpful for offices that have no receptionists or when nobody is available to offer assistance to the reception guests. With Greetly, visitors can easily sign in by choosing their purpose of visit. The software then notifies the office or host employee and intakes the visitor’s information. The process takes less than a few minutes and saves both visitor and the employee time. Why Use Customer Support Software? Why use customer support software? Here are the benefits of customer support software. Never miss a ticket. A loss ticket can send a customer on a rampage and, worse, you lose his business. Customer support software automates ticket routing and tracks ticket statuses to ensure all customer inquiries are accounted for. Managers and team leaders may also be alerted of pending tickets, avoiding escalating issues. Furthermore, since tickets are associated with related records including previous conversations, an agent can quickly take over a ticket without repeating the process from scratch, a really annoying scenario for customers. Automate processes. Time-consuming repetitive processes like ticket sorting, routing, queuing, routine reporting and other administrative tasks can be automated and save your support team time for more important tasks. Gain customer insights. As you accumulate tickets, issues, resolutions, cases and support interactions, your customer database becomes a trove of insights on your market. Using analytics you can run reports on key metrics and discover patterns or trends that otherwise may have escaped the naked eye. Over a period of time you will have a better perspective of your product’s vulnerabilities based on customer complaints. Likewise, you will have a more accurate feel of your market, which allows for more responsive campaigns or product development. Deliver 24/7 support. Many solutions provide a way where customers can send their inquiries via email outside of business hours. The emails are automatically transformed into tickets and routed to the first available agent during office hours. This way, you are essentially providing all-day, year-long access to your customer service. Enhance agent training. Customer support software gives you a clear picture of how your agents perform, not only on a per-case basis but over a period of time. It is easy to see if your customer service is improving or sliding down. This insight enables you to plot possible skills gaps and develop training to fill in the cracks. Provide the right service. Not all customers are equal, especially if you have service-level agreement (SLA). SLAs are your promised level of support that customers expect once they sign up with you. Customer support software commonly provides a field in the customer record that indicates its SLA. Other systems also automatically route premium SLA tickets to the right agents, eliminating the time-consuming task of ticket sorting. Build a knowledge base. Resolved tickets can be channeled to a knowledge base to build your FAQ portal. The more unique cases you receive, the more robust your FAQ portal becomes. Eventually, recurring customer inquiries can be routed to this portal and remove repetitive workload off your support team’s daily schedule. Solicit testimonials. Customer service software can capture a customer’s positive experience. A call can be recorded or an email traced and, with permission, the information can be repurposed as a product testimonial for your site or software review platforms. What Are the Types of Customer Support Software? How does customer support software work? That depends on its type. We can consider customer support software as the general category where more specific solutions fall under. They are grouped based on their core function. On this note, we can categorize them into three major types. Help desk. It is commonly interchanged with customer support software, but to be strict about it, help desk software only addresses the break-fix aspect of customer service (hence, the term “help”) and is often focused on the technical side of the product. The help desk software is designed to answer FAQs and problem-solution cases, usually featuring a robust knowledge base of the product specs. IT service desk. It also addresses the product’s technical aspects and break-fix cases like help desk, but adds another dimension: service. This can mean accommodating requests like buying a new equipment or software license, for example. Live chat. While it is a tool that can be integrated in help desk or IT service desk, live chat is commonly offered, too, as a standalone software. It can serve both the functions of help desk and IT service desk. Call center software. Like live chat, it can be integrated in help desk or IT service desk, but is also offered as an independent solution. The primary focus here is customer service through voice calls. What Does Customer Support Software Do? What does customer support software do? Let’s discuss the features of customer support software. Ticket management. You can say it is the soul of a customer support software, designed to resolve customer inquiries. A key feature to look for here is automation, especially the capability of the system to route recurring issues to a FAQ section, thus, freeing your agents to focus on unique cases. Likewise, many solutions can automatically qualify customer issues and transform them into tickets. This is possible by integrating the system with email clients like Gmail or Outlook. You can even send and receive emails within the system, thus, no need to shuffle from one interface to another. Another important tool is the agent collision prevention. It lets agents see who is handling a ticket or have handled it for added context. The ticket is usually updated in real time so the current agent has the latest information on the ticket’s progress. Ticket management also ensures all customer inquiries are accounted for and alerts you of pending tickets. Other functions include the capability to escalate, close, reopen and collaborate on tickets. Many solutions allow for customization of the module’s fields, statuses and interface to suit your workflows. Customer management. A centralized database consolidates all customer interactions to help agents quickly locate tickets, issues, requests and other customer interactions. It is more than just a repository of records; it lets you peek into actual scenarios faced by your customers, which adds more insights to your target personas, in general, and lets you personalize your campaigns, specifically. Features include the ability to quickly attach notes to customer records that are shared with the support team. You can also associate customer records with pertinent data, such as, past purchases, SLAs, specific product lines and other historical interactions with your company. LIkewise, advanced customer support software may allow for structuring the customer database on parent/child hierarchy based on shared traits like related tickets, geolocation, demographics and product lines. This database is also key to generating reports that reveal key metrics like recurring issues, resolution time and unique cases. Customer satisfaction rating. This feature helps managers and team leaders monitor the ability of their support team to solve issues that satisfy customers. Generally, it has a standard post-resolution survey, where customers input their level of satisfaction in a multiple-choice questionnaire. Other systems may feature varied tools, for example, a trigger system that alerts team leaders on an escalating issue or an automated agent rating system. Reporting and analytics. Most solutions are capable of pulling data from the customer database and process aggregated data for patterns, trends and other insights that may be valuable for critical business decisions. Reporting tools may generate graphs and charts that make it easy to understand business intelligence, for example, line graphs for historical trends or pie charts for measuring various parts of a whole. Depending on the solution, you get a set of templates that help you generate reports with a few clicks. Features may include filtering, sharing and user permissions. Likewise, a software may also provide analytics that aggregate public customer data from social networks and other web sources. Agent performance rating. This can be a subset of analytics and reporting or a standalone tool. Specifically, the tool is used to assess an agent’s resolution time, ticket volume, conversational skills and other areas that reveal her strengths or weaknesses. The rating can also evaluate win-loss rate for agents with overlapping sales tasks, for example, outbound calls to solicit product upgrades from current subscribers. Self-service portal. This is an important module to help you cope with high ticket volume and, indeed, is one of the advantages of customer support software. In general, it features an FAQ database and knowledge base that contains other information like product specs and case studies. Customers with inquiries that have been resolved in the past are automatically routed to this portal to help themselves with the answer. Look for features like ticket deflection and automated routing. In some systems, the self-service portal also allows customers to view their ticket status, raise another ticket or enable live chat with agents. Task management. This can be integral to ticket management or a separate module. It lets managers and team leaders to assign tasks to specific agents or associate tasks with tickets or customers. There are also notifications and reminders that prevent tasks from slipping into cracks. Some systems also allow tasks to be divided into subtasks. Product database. A customer support software may feature this module or integrate it with the customer database. The product database houses all the specs and data about your products, which can easily be retrieved by agents for reference. Likewise, product records can be associated to customer records for added context. Mobile access. The software may have mobile apps that allow for accessing the system and customer data. Many solutions only provide a mobile version with limited functionalities, while others have fully featured mobile apps. Likewise, some solutions, instead of developing mobile apps, feature mobile-responsive system that adjust to any mobile device. Collaboration. Working as a team on a difficult ticket is critical to customer service; hence, many solutions provide collaboration tools. These include the ability to communicate with other agents in real time and isolated from the customer, create group chats, user groups, share calendar and tasks, integrate wiki and co-build the knowledge base with resolved cases. Live chat. Some customer support solutions have this tool to give your online audience immediate assistance. A live chat widget is embedded in your site, social page or newsletter. This tool is also useful to capture leads, for example, web visitors inquiring about your product. Likewise, it gives you a semblance of 24/7 support since the live chat can be configured to accept messages and forward them to your email outside of business hours. Customization. Most customer support solutions allow front-end customization, which includes tinkering fields, tables and the UI to match your processes. Other systems also provide an open API for deeper customization, such as module interactions and rule-based outputs. Integrations. A customer support software must be able to integrate with other important business processes, such as, CRM, productivity apps, developer tools and social media networks. LIkewise, it must provide an API key to let you integrate your third-party apps for a more customized interface or workflow. What Should You Consider When Buying an Customer Support System? Type of customer service software. We have explained above the nuances among different customer service software types. What kind of customer service you want to provide and the resources you have will influence the kind of solution you need. Live chat may be attractive and affordable, but you may need a hands-on team round the clock. A call center software obviously demands more skills from your agents since they’ll be conversing verbally in real time. Find out first your capabilities and match them with the right software type. Scalable features. Your customer service requirements now will likely change as your business grows. Can the software grow with your needs? For example, you may be okay with email support for now, but tomorrow, you may need a call center or advanced analytics as competition heats up. Likewise, as you expand to other markets outside the U.S., make sure the software can follow suit. Integration. Support is one of the three customer-facing processes (the other two are sales and marketing), hence, the customer support software needs to integrate with other key business processes to leverage customer data. Primarily, it must be able to export its data to CRM and sales solutions and vice-versa for customer insights. Other apps that it needs to work smoothly with include business productivity, email clients, business intelligence and app connectors. Make sure, too, that the software has an open API so you can integrate your own apps, should you need to. Mobile access. While your agents are stationed in their workstations, you or your managers should be able to access the system from smartphone. This is useful when attending client meetings or conferences or taking a business trips. This way, you’re always on hand to help your agents for urgent cases or key decisions during crises. Remote access. Cloud customer support software solutions excel in this aspect. They allow for using the system anywhere there is internet. This gives you the flexibility to hire offshore agents or home-based staff without you leaving your place. Other requirements. The software should be easy to use to ensure fast onboarding of new agents. Likewise, it must come with reliable technical support, especially if you lack an in-house IT team. Also look for a free trial that includes all features, not just a few, so you get the whole picture of the system. What’s the Cost of Customer Support Software? The cost of customer support software is usually on a per-user basis. It can be billed monthly or annually, with the latter featuring discounts to entice long-term subscription. Freshdesk. Some solutions offer a free app to entice upgrades in the future. For example, Freshdesk offers a free app for unlimited agents. It features email channel, access to its App Gallery and basic social channel. Paid plans start at $19 per user/month. LiveAgent. Another pricing strategy is to offer the plans by module. LiveAgent offers ticket plan only, ticket plan + chat and all-inclusive plans. Pricing starts at $12 per user. Zendesk. Most solutions only offer paid plans like Zendesk. The plans are arranged in a way that will grow with your business needs. Zendesk starts at $5 per user/month and peaks at $199 per user/month. TeamSupport. Sometimes pricing can be segmented between small business and enterprise features only. TeamSupport features a small business plan which starts at $40 per agent, and enterprise plan at $55 per user. Samanage. Pricing can also be on a quote basis to match your exact needs. In this case, pricing is dependent on various factors like the number of users, devices and feature set. Samanage requires quotation for its separate modules, such as, IT service desk, IT asset management and integrated IT solutions. All three modules can work seamlessly together. What Are Potential Issues When Implementing an Customer Support Software? Too much automated support. Customers may be annoyed when they have to key in a lot of choices before getting a human voice or an answer to their question. This has been a material of many a sitcom. As a rule of thumb, limit system automation that asks for customer inputs to two tiers, thereafter, the customer should already be connected to your agent or knowledge base. Unattended live chat. It’s worse than being unable to provide live chat on your site. Once you’ve plugged in a live chat on your site, make sure someone is monitoring the tool. An unattended live chat speaks volumes to customers that they are not important or that you don’t have time for them. It’s better not to have this tool if you lack the commitment to attend to chat inquiries. Security issues. As with other cloud solutions, a cloud customer support software is vulnerable to hacking. Customers reveal sensitive data like credit card details, personal information and bank accounts over the support channel, which are a prime target for cyber sleuths. A customer support software with bank-grade security should alleviate this risk. Likewise, since customer data is shared among agents, a vengeful employee can quickly wreak havoc to the entire database. Underutilized system. If the software is difficult to use, it is likely that managers and agents will only use the basic features. This undermines the cost you’ve invested in the system. What Are the Latest Trends in Customer Support Software? AI chatbots. Machine learning, predictive analytics and other AI technologies make it possible now to launch machine chatbots that can follow human conversations. As of today, we already see AI chatbots handling basic customers questions, but we expect chatbots in the next few years to even provide intuitive answers to complex issues. It is not a hype to expect that the entire customer support software category wiped out in the next decade because AI chatbots are integrated in other key business systems and front-end devices. Big data-driven personalized service. The availability of big data, customer data that you culled from various sources including your own systems and social media networks, makes it possible to personalize service down to the specific preferences, interest, habits and history of customers. Big data will also allows customer support to pinpoint with accuracy trends and insights. Internet-of-Things. IoT connects devices to the cloud, which makes it possible to closely monitor and anticipate customer needs. One impact that IoT will bring to customer support is the ability for customers to connect the device to a support system. For example, a IoT home device connects to a customer support software to solve a bug. This setup may even be automated in the far future and will not require the intervention of either the customer or agent. It may even disrupt the need of traditionally setting up an office of customer reps with the device and system able to communicate directly.